Forget mere chemical reactions; in space, matter-energy conversion creates unprecedentedly powerful explosive events. The largest group of newborn stars in our Local Group of galaxies, cluster R136, contains the most massive stars we’ve ever discovered: over 250 times the mass of our Sun for the largest. Over the next 1-2 million years, there will likely be a large number of supernovae to come from this region of the sky. 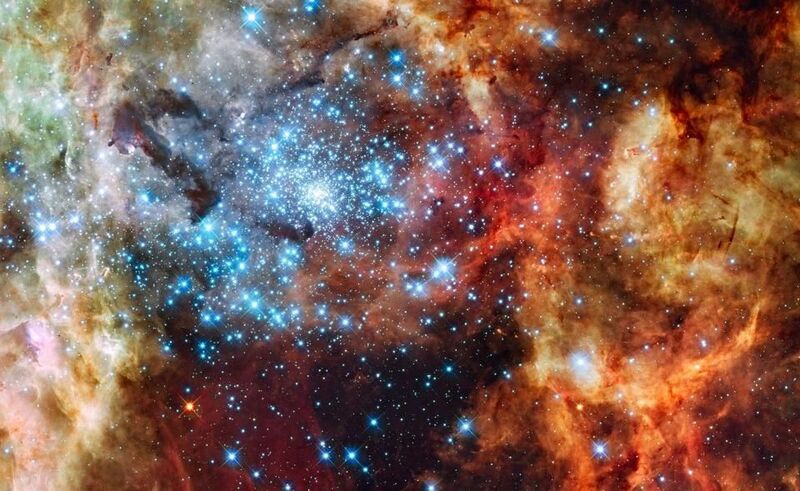 But even this level of star-formation cannot compete with the most energetic fireworks the Universe has to offer. 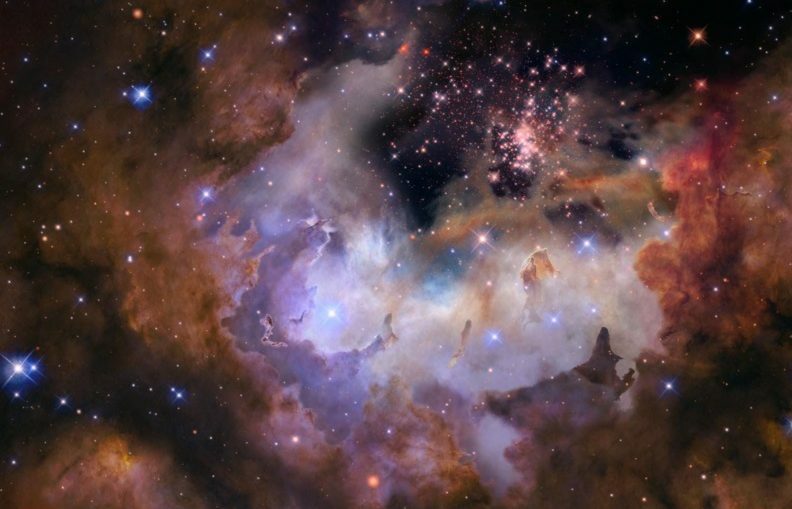 Here are the 7 most powerful natural displays of cosmic fireworks. 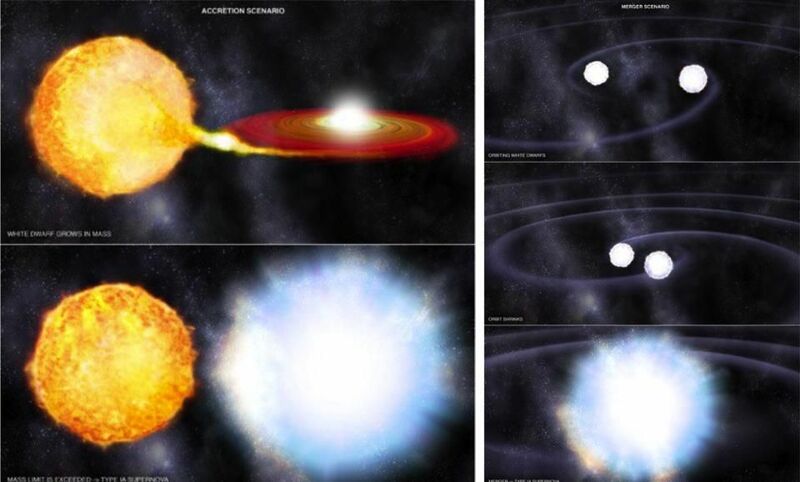 Two different ways to make a Type Ia supernova: the accretion scenario (L) and the merger scenario (R). But no matter how you analyze it, these explosions still outshine the Sun by a typical factor of around 10 billion at peak brightness. 7. Type Ia supernova: when two white dwarf stars collide, they initiate a runaway fusion reaction, destroying both stellar remnants. 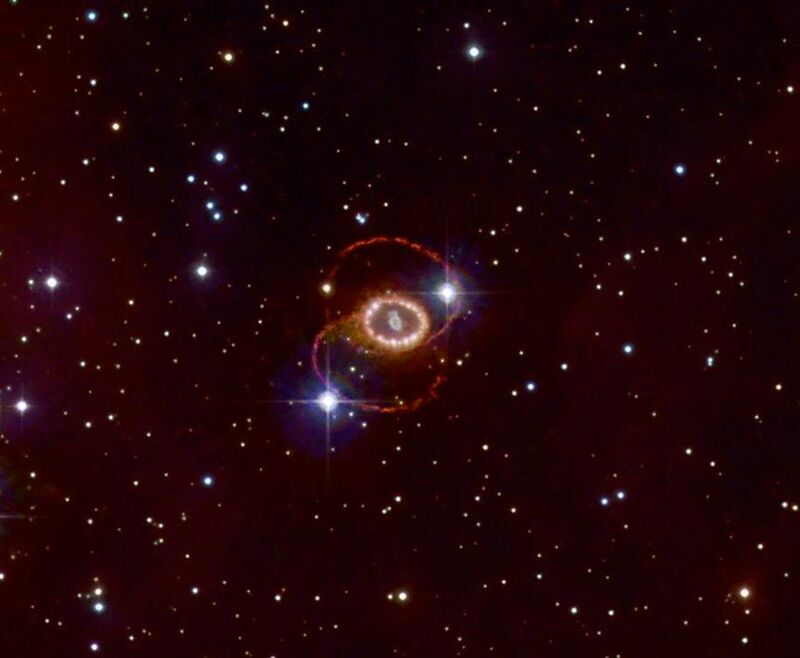 The remnant of supernova 1987a, located in the Large Magellanic Cloud some 165,000 light years away. This is the closest supernova to occur to us in over a century. The fact that neutrinos arrived hours before the first light signal taught us more about the duration it takes light to propagate through the star’s layers of a supernova than it did about the speed neutrinos travel at, which was indistinguishable from the speed of light. 6. Core-collapse supernova: when a supermassive star runs out of fuel in its core, it collapses, releasing energy and forming a central neutron star or black hole. This diagram illustrates the pair production process that astronomers think triggered the hypernova event known as SN 2006gy. 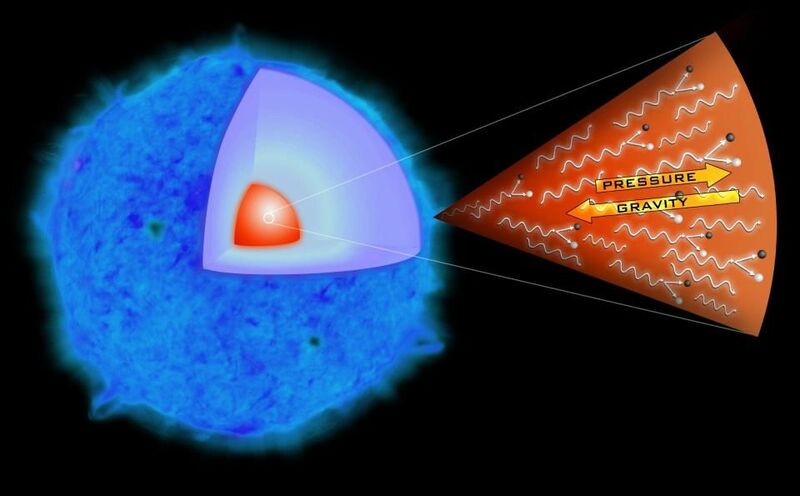 When high-enough-energy photons are produced, they will create electron/positron pairs, causing a pressure drop and a runaway reaction that destroys the star. Peak luminosities of a hypernova are many times greater than that of any other, ‘normal’ supernova. 5. Hypernova: ultramassive stars create particle/antiparticle pairs inside them, causing a catastrophic collapse and a star-destroying explosion. They’re the most energetic variety of supernova. 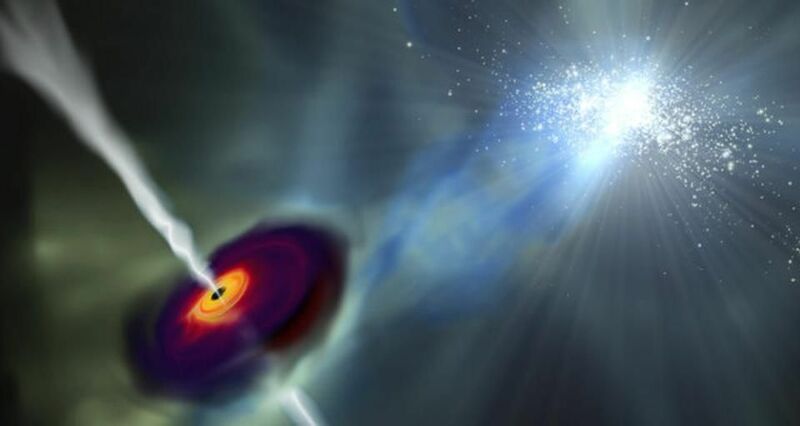 Distant, massive quasars show ultramassive black holes in their cores. By accelerating matter around the black hole, whenever they’re actively feeding, they can shine even hundreds of times as bright, over the observable energy spectrum, as an entire Milky Way-like galaxy. 4. Quasars: as supermassive black holes feed on matter, they heat and accelerate it, emitting high-energy light and easily outshining entire galaxies. 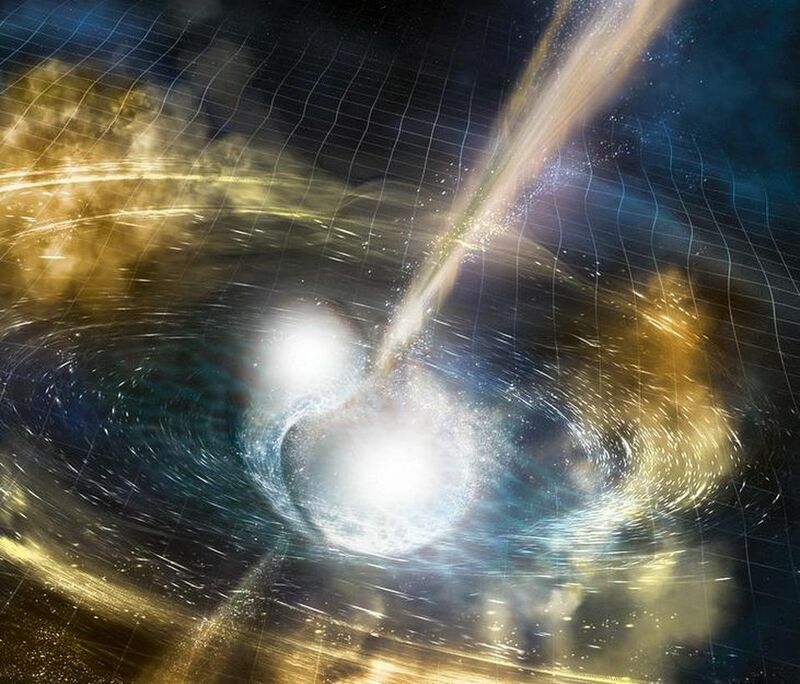 Neutron stars, when they merge, can exhibit gravitational wave and electromagnetic signals almost simultaneously. But much understanding must be gained concerning the details of the merger, as the theoretical models don’t quite match what we’ve observed. 3. Neutron star mergers: directly observed by LIGO and then via electromagnetic signals, they convert mass into energy directly in a tremendous burst. 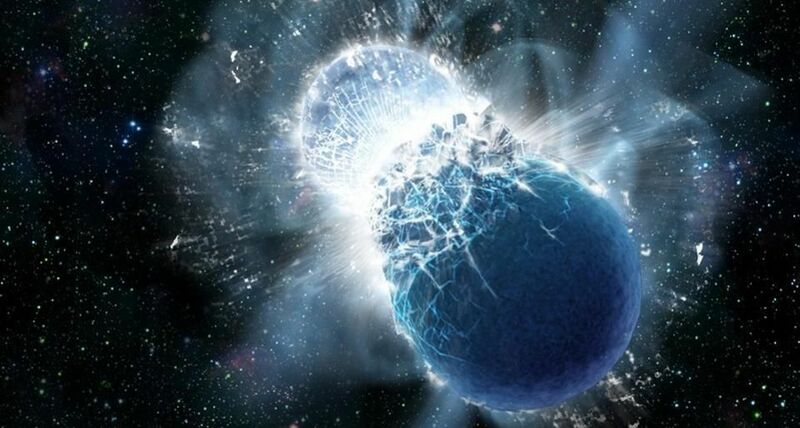 Artist’s illustration of two merging neutron stars. The rippling spacetime grid represents gravitational waves emitted from the collision, while the narrow beams are the jets of gamma rays that shoot out just seconds after the gravitational waves (detected as a gamma-ray burst by astronomers). Mass, in an event like this, gets converted into two types of radiation, but the level of collimation in the jets determines the energy received by an observer on Earth. Some hypernovae can also create collimated jets of this intensity. 2. Gamma ray bursts: a special case of neutron star mergers or supernovae, these arise from extremely collimated jets, providing the brightest electromagnetic signals in the Universe. 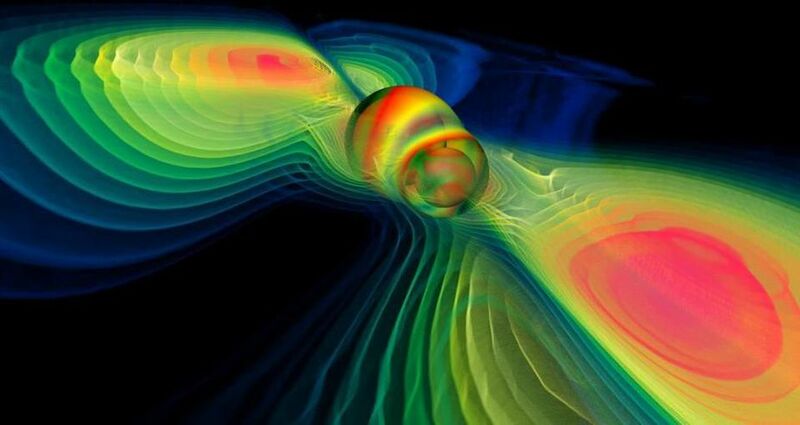 Computer simulation of two merging black holes producing gravitational waves. 1. Black hole mergers: at the moment of the merger, they can convert many solar masses into pure energy, outshining all the Universe’s stars combined. 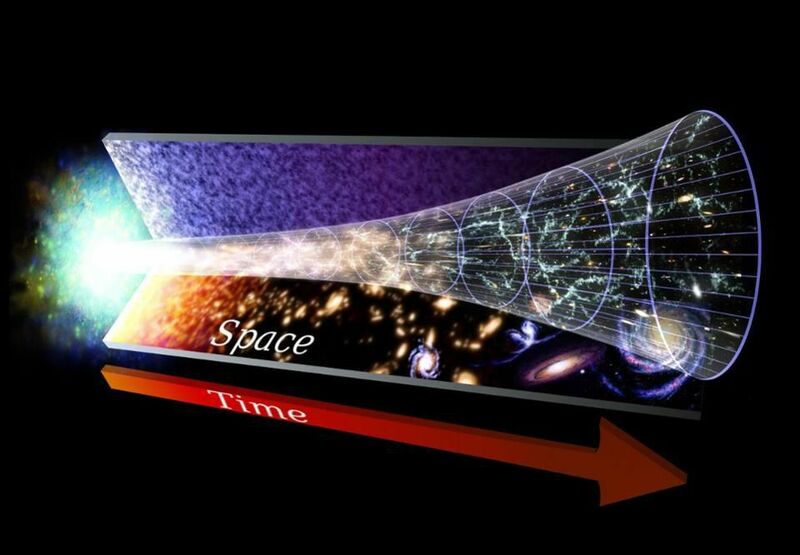 There is a large suite of scientific evidence that supports the picture of the expanding Universe and the Big Bang. The entire mass-energy of the Universe was released in an event lasting less than 10^-30 seconds in duration; the most energetic thing ever to occur in our Universe’s history. In terms of energy released, only the Big Bang was more energetic.